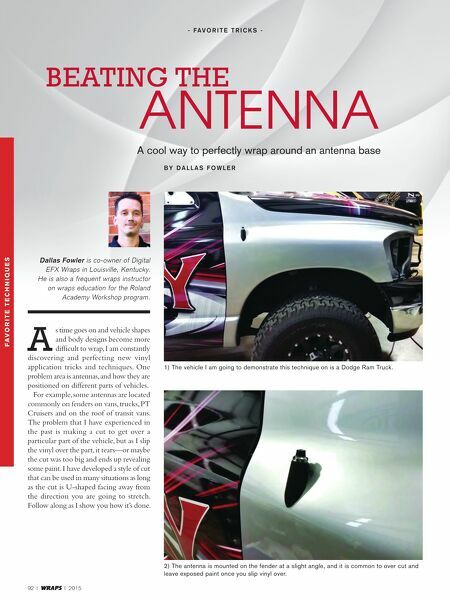 92 I WRAPS I 2015 Beating the AntennA - F a v o r i t e t r i c k s - A cool way to perfectly wrap around an antenna base B y D a l l a s F o w l e r a s time goes on and vehicle shapes and body designs become more difficult to wrap, I am constantly discovering and perfecting new vinyl application tricks and techniques. One problem area is antennas, and how they are positioned on different parts of vehicles. For example, some antennas are located commonly on fenders on vans, trucks, PT Cruisers and on the roof of transit vans. The problem that I have experienced in the past is making a cut to get over a particular part of the vehicle, but as I slip the vinyl over the part, it tears—or maybe the cut was too big and ends up revealing some paint. I have developed a style of cut that can be used in many situations as long as the cut is U-shaped facing away from the direction you are going to stretch. Follow along as I show you how it's done. 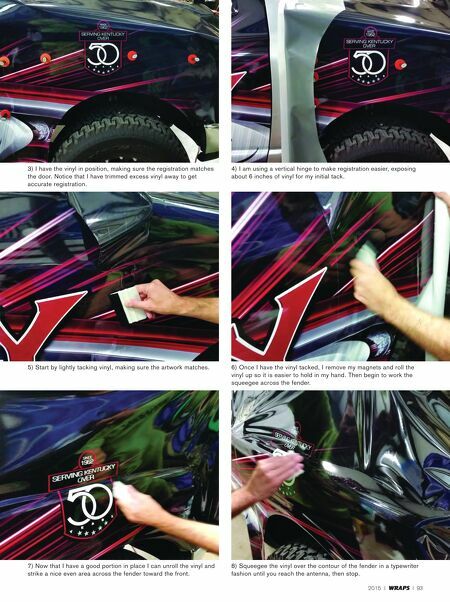 Dallas Fowler is co-owner of Digital EFX Wraps in Louisville, Kentucky. He is also a frequent wraps instructor on wraps education for the Roland Academy Workshop program. F av o r i t e t e c h n i q u e s 1) The vehicle I am going to demonstrate this technique on is a Dodge Ram Truck. 2) The antenna is mounted on the fender at a slight angle, and it is common to over cut and leave exposed paint once you slip vinyl over.